Why Traffic Swirl? – Because It's Different Than ANY OTHER Traffic Exchange Online! 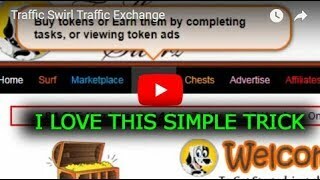 Because It's Different Than ANY OTHER Traffic Exchange Online! The Short Answer to the question Why Traffic Swirl, is because I find people that take action and produce: MORE CONVERSIONS! Any traffic exchange will produce traffic to your blog or website, but this one gets results. If you haven’t yet, Click Here To Join FREE! Traffic Exchanges have been around for over a decade and in the early days, they were a simple way to produce referrals for various websites almost like magic. You could put together a Splash Page (explained later) and generate 100 signups overnight with no strain. Sorry, Those Days Are HISTORY! That’s why I decided to create this blog to share how I use advanced strategies with Traffic Swirl to overcome the shortcomings most traffic exchanges have today. Look over the post menu on the right (or the bottom) as well as the page menu above and see if you don’t find some new ideas you can use too. If you thought you would find a long list of traffic exchanges I want you to join so I can get free referral credits, I quit doing that a long time ago. Who needs more worthless credits to get in front of people who don’t even bother to read your pages? Thanks for some great insights into TrafficSwirl here Warren. I have been a surfer for some years but I must admit I hadn’t taken time to think out of the box with them as you have managed to do here. Some great tips I will definitely take forward with me. Thanks for that video. Although I’d looked round Traffic Swirl you showed me some interesting things I’d missed! Shhh, You’re giving away all the secrets! WOW, a comment from the man himself! Great insight. Thanks for turning me onto Traffic Swirl. We’ve Been Buddies For A While, And As Usual, You Hit The Nail Right On The Head. I “Avoid Mindless Surfing” As Much As Possible, Just Like My Usual Token Ad Proclaims. Thanks for asking Rolandas. I gain credits, but only to sell them for Tokens along with all the other prizes I win for surfing. I offer the Tokens to those who are willing to complete a Task for me, which in most cases is to join a website I want referrals for and yes I do get engagement from doing this. I think it’s the only traffic exchange that has this benefit, so it’s where I put all my effort. Nice info Warren! It’s interesting to find out about all those features I haven’t used yet!